Scenic View of Towering Mountains, 375×145cm. The long history of Chinese painting art is sated with numerous great artists and works alike. How can people today inherit tradition while developing a new artistic language that captures the spirit of the times? Dong Xiyuan, a contemporary Chinese painter, has come up with some answers. After a long period of exploring specific techniques and painting languages, Dong successfully internalized the most important elements of traditional Chinese painting and injected them into his own experiences and expressiveness, resulting in an impressive combination of tradition and innovation. As an artist, Dong is firmly grounded in his own era and determined to do it justice. Chinese society is witnessing dramatic changes, and Chinese culture is receiving increasing attention from around the world. For many years, Dong has remained passionate and idealistic in his art philosophy. He is determined to write a chapter in art history with his brush. A Sketch of the Yellow Mountain, 96×178cm, 2011. The overall goals for Chinese painting of this new era have posed serious challenges for painting practitioners: How should they interpret tradition, and what specific language style should be used? At the same time, this era has also provided many possibilities. Dong has worked hard on landscape paintings and flower-and-bird paintings, and become proficient in visual expression in both fields. Traditional Chinese landscape paintings must depict objects, and more importantly, express emotions because the practice embodies the spiritual pursuit of “harmony between man and nature” in ancient Chinese philosophy, awe and respect for nature, and connections between the artist and the world. Dong’s landscape paintings demonstrate a harmonious fusion of objects and emotions. His paintings are known for two distinctive features. The first is the pursuit of the aesthetic beauty of mountains and rivers. 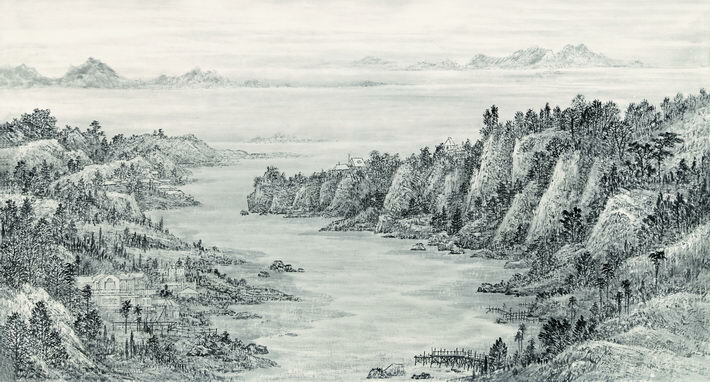 Dong followed the academic method of ancient Chinese artists to “sketch a draft from nature itself.” He often ventured through mountains and over waters to inject the scenery into his landscape art. In his work, we see myriad mountains and valleys, tumbling clouds, running streams and majestic waterfalls, all of which demonstrate the magnificence of nature. The other trait is that Dong’s landscape paintings feature an ingenious combination of realistic and freehand styles. In general, his landscape works feature elaborate and fine brushwork, but are a bit different from traditional Chinese realistic painting. He provides details on the landscape structure and remains meticulous in the usage of lines and colors. With his contemporary landscape paintings, Dong has formed a unique style marked by close attention to details, which evidences his excellent techniques in painting. An old Chinese saying goes, “fullness is beauty,” in reference to an aesthetic state of fullness and abundance. In this respect, Dong’s landscape paintings have achieved a rare balance between a fascinatingly majestic appearance from a distance and meticulous details up close. Despite the fact that his style remains imperfect for now, Dong’s pursuit represents his independent exploration of landscape paintings. Sketch at U.S. West Coast, 168×96cm. Dong’s bird-and-flower paintings share a similar inner structure. He depicts vivid forms of flowers and birds the same way he composes landscape paintings: with intricacy of detail and outstanding line shaping. But in these pieces, the focus is on displaying a life form of hope. Bird-and-flower paintings and landscape paintings are two different realms, but Dong has managed to transcend different realms of art. He can express his feelings naturally with his paintings, embodying his deep immersion in art. He is also an artist persistent in creation and has paid his dues in exploring art. More importantly, he considers it his own duty to promote the development of Chinese painting in the new era and views innovation in Chinese painting as his academic goal. This motivates him to keep moving and challenging himself to reach new artistic heights. The essence of Chinese painting is a continuous march to a higher spiritual realm. Dong is well-experienced just as he reaches the prime age for artistic creation. In the future, his painting style will probably branch out into more diverse forms. From the perspectives of painting techniques, spirit and competence, he has great potential.